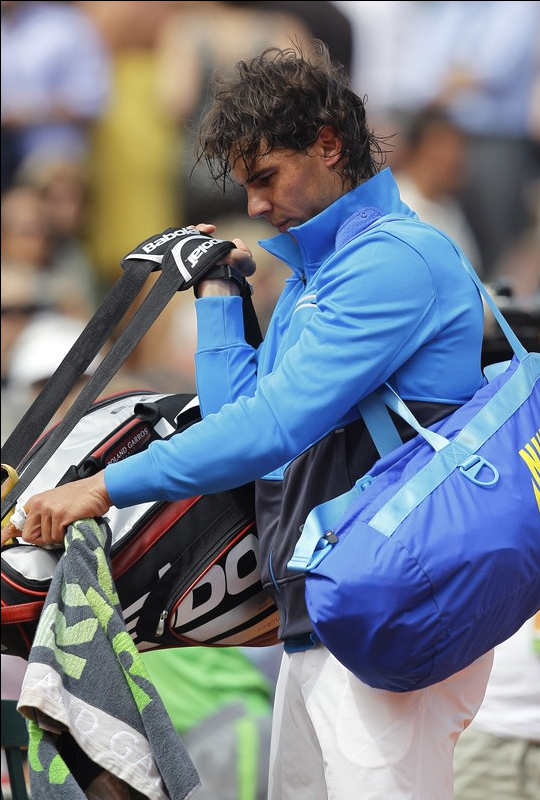 1 - Nicolas Goncalves: Hi Rafa. I'm going crazy because I have tickets to the final of Roland Garros. Do you think I'll see you there? I hope so. Against whom would you like to play the final this year? I wanted to tell you you're an example to everyone, not just for professional athletes. See you next Sunday. Rafa:I hope so, but I am sure of anything ... I have to improve my game! And the truth is that I do not care against whom. But as I said before and I have to get by my major obstacle, or rather my direct competitor right now, today, is Soderling, who is my quarterfinal match. The rest, as I always say, is far! 2. Maria Andreu: It seems unfair the ATP rankings in that you won't get 500 points of Godo until August and Djokovic will not be subtracted 360 of Monte Carlo 2010 (I guess they are deducted in November). In this way, 'Nole' to reach the final to become number 1, even if you win the trophy. What do you think about this issue? Champion Cheer! A hug. Rafa:It is a complicated issue to explain this in two sentences. Unless I am mistaken, my site put up some at the time (http://www.rafaelnadal.com). 3. Isamar S: Hola Rafa! I follow you for many years and send you much encouragement. I have understood you left high school studies. What modality were you doing? Science, Humanities ... If you had the opportunity to make a college education, what would you have liked? Rafa: I would have done something related to sports, but anyway I always knew I wanted to be an athlete so I got what I wanted. 4 - Jose Abel Gonzalez Pardo: My question is related to your shoe. I wanted to know if there is much difference between the commercial and yours, that is, is it made to your needs or are modified to suit you more / less weight, ie with your own whims. Did you change as a result of string? If so, on what note? with what tension do you play? Greetings. Rafa: Mine has a weight that surely varies with the commercial one. But this you or your store can change by adding him leads to make it slightly more heavy. It others is the same, The black strings work very well for me, the truth. 5 - Chantal Reyes: Hola Rafa! First of all congratulations on your season, anyway, it's still fantastic. I had the opportunity to see first play this year in the Madrid Masters against Michael Llodra, and say it was the best experience of my life. Feelings aside, I wanted to ask you, do you usually watch the matches of your opponents when you finish yours to see at what level they are? Thank you very much. Rafa: Sometimes I see matches, but not always. Also my old games to see how to do some things. But it's not a very common thing, because we know each other well. Only, as I say, sometimes because I have some doubts or lack memory. 6 - Arturo Baeza: Hi Rafa, first tell you you're a great champion on and off the court and a great person, following what everyone says who knows you. My question is this: Have you ever thought about training with someone who is not your uncle Toni? I ask because maybe you've already burned a stage and is now entering a new one to move forward and grow as a player. Thanks and many successes. Rafa: No, not right now. It is true that sometimes also trained with Francis Roig. The combination is perfect. 7 - Angel Zapata: Rafael encouragements. From now starts good, so I just have to enjoy your tennis and stop thinking so much, just salt, enjoy and give hard. Why do you complain if you your right, do not use more than the reverse, that yours backhand crosscourt that drifts away from the opponent? 7- Angel Zapata: Spirit Rafael. From now on begins the good thing, so already only you have to enjoy your tennis and to stop thinking so much, alone salt, enjoys and try hard. Why don't you utilize more the BH, when you're having problems with the FH, your cross court BH which moves away from the opponent? Rafa: Well, it's an easy one (answer), because the ball comes to me very fast and gets me wherever the opponent think could cause most damage. Anyway, my FH was always one of my main weapons so you better follow. 8 - Cristina Fernandez de Castro: First of all I want you to know of my support. I think the match against Ljubicic was the best game in the last three. I think that you hardly sweated and suffered for the first time. Going from strength to strength. Do you think that this level will be higher in the quarter? Rafa: I hope so, but I'm not a fortune teller and I do not know how I will play. I hope it gets better otherwise it'll be hard to win! 9 - Jesus Rosary: Buenas Rafa: Congratulations on your match against Ljubicic, do you see yourself playing tennis at 32, like him, and outside from the Top 10? You've won almost everything, I can hardly imagine enjoying tennis competition when aged and younger ones begin to stray from the places "noble " of the classification ... Thank you very much, encouragement and good luck. Rafa: Uy, I do not know. Maybe not, but I will continue while very competitive. 10 - Juan Navarro Amaro: What do you think of the movement 15M? You are a young privileged but have an opinion of this movement. Rafa: I prefer not to comment on these things. It is clear that I have my opinion about it, but I do keep to myself. I always do with politics. Thanks.